In a recent post, I asked my readers to help me identify those catalysts that force the actions required to steer our future towards advancing our human development. Feel free to respond to the Poll. The number one response was the rapid pace of innovation. That response supports my own opinion that the pace will ultimately force stakeholders across multiple domains to take action. Much like the Domain Convergence that occurred during our most Transformative Period in History, convergence is required if we are to take the correct path towards human flourishing. Balancing the Opposing Forces of Innovation is critical to enhancing our future. 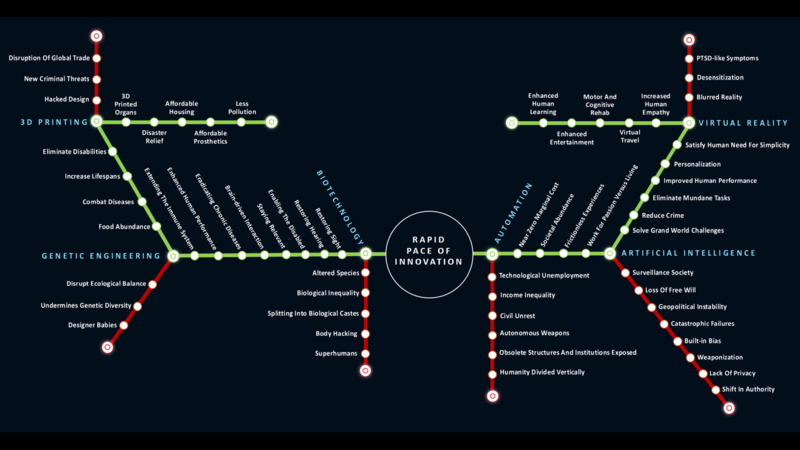 This subway diagram focuses on two paths: one that enhances human development (green), and one that diminishes it (red). The station stops are the major innovations likely to have the biggest impact in either direction – but we could add several other stations based on the number of Building Blocks available to society. Click on the visual to expand it. In a recent book titled The Big Nine, author Amy Webb describes three future scenarios for artificial intelligence: optimistic, pragmatic, and catastrophic. This type of exercise is instructive, as it paints a picture of the potential paths for one of our station stops – and that’s just one stop along the way. What happens when the various stops spawn new stops? What happens as they converge and amplify impact? In the aforementioned book, our author describes the prescriptive steps to be taken to ensure a path towards human flourishing. We’d be wise to heed her advice.